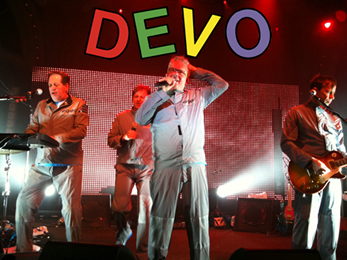 Mathew: DEVO rocks pretty hard for a bunch of old guys! Their new album is pretty good and man, they totally kicked it on every song they performed! High energy! Costume changes! Wacky hats! WHIP IT! WHIP IT GOOD! Helm: You miss the point. DEVO is a philosophical statement about the sorry condition of mankind. They are rock philosophers of the penultimate degree. Mathew: The penultimate degree? Why can't you just enjoy them for the simple pleasure they bring? You told me I was over thinking HANSON, for god's sake! You're totally overthinking DEVO. Helm: You were over thinking Hanson. It is not possible to over think DEVO, though I suppose it might be possible for a more intelligent person to think about them the appropriate amount. Helm: The truth is oft' painful medicine. Mathew: Look, I get that Freedom of Choice is about how we'd rather choose not to choose than put in the hard work and accept the risk of failure that comes with making intelligent choices, but explain how a song like Uncontrollable Urge has any deeper meaning. Helm: The tremendous collision of the uncontrollable passion that Mark Mothersbaugh is singing about with the tightly controlled, almost mechanized vocal and physical performance through which the lyrical content is delivered speaks volumes to the plight of modern humans. All people are torn between their dual natures as both base animals and lofty higher intelligences, as both free individuals and highly constrained social animals. This cuts to the very heart of the origin of the lowest human evil and highest human transcendence. And it is clear that DEVO believes most humans are losing in their fight to keep these energies in positive tension. Helm: Is this not how you interpret that song? Mathew: Not by a bow-length. Helm: This is obvious stuff. How did you read it? Mathew: I thought it was about...you know...masturbating. Helm: Why did the Gods curse me with you as my Valhalladrim? WHY?! Mathew: Well, what about Space Junk then? That's just about a girl getting hit by a piece of Sky Lab. Helm: No, it is about the way your modern technology endangers you even as it appears to free you. Sally was killed by a piece of technology designed to facilitate greater communication. As the world becomes a smaller place, it degenerates into a seething mass of frivolous human noise that endangers all life and fills every space. I am amazed that DEVO was prescient enough to write this song even before the birth of reality TV and shows like Jersey Shore. Mathew: Well, they didn't play that one in concert. Helm: True, but they played a vast number of great songs. Mathew: Agreed! And the coolest thing was we got right up to the stage. I swear, we were close enough that I could have stuck my finger up Mark Mothersbaugh's nose if I'd felt like it. Helm: Which would have proved his point about devolution quite nicely.